We believe that everyone has the potential to be successful. Whether you are trying to lose weight, manage diabetes, lower cholesterol, control blood pressure or reduce GI symptoms, you have come to the right place. Our goal is to provide you with the tools you need to meet your nutrition goals. We translate the science of nutrition into real life solutions that fit your tastes and your unique lifestyle. Nutrition Works provides accurate, up-to-date and evidence-based health information, personalized for you. We offer many different counseling and education programs to assist you with developing strategies to be successful with achieving your individual nutrition goals. Based on your medical needs, we’ll help you set achievable goals, eating real foods that taste good. Services at Nutrition Works are provided by 8 licensed, registered nutrition consultants. 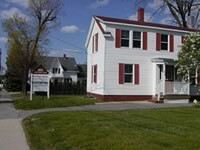 This Portland, Maine, practice has been helping people through one-on-one nutrition counseling since 1988. To schedule an appointment, contact us by phone at (207) 772-6279 or ask your health care provider for a referral. Please note that we are unable to respond to scheduling requests through email. We offer a range of inspirational and educational nutrition and wellness classes at our classroom or your worksite. In addition, we provide a variety of consulting services to business and industry, including corporate wellness programs.